IPB University is fully committed in realizing its vision to be a technosociopreneur campus. In its effort, IPB partners with Indonesia Chamber of Commerce and Industry (Kadin) Bogor. “To realize our vision, we need supports from every stakeholder. 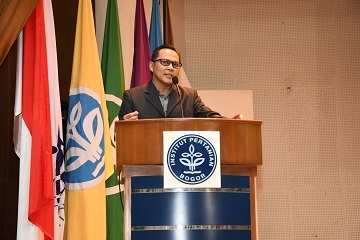 We will produce new entrepreneurs, not only ones that are advance in technology, but also those who have high social concern,” said Dr. Drajat Martianto, Vice Rector in Education and Student Affairs. According to him, entrepreneurs who have a high social commitment are very much needed in Indonesia. This is because Indonesia is very diverse socially and economically. The agroecological potential is also very diverse, so it does not only require entrepreneurs but also social entrepreneurs. The Chairman of the Kadin Bogor, Erik Irawan Suganda, fully supports IPB's efforts in creatong new entrepreneurs or new start-ups among students. He conveyed this support in the IPB and Kadin Goes to Campus Present, 2019 Agromaritim Start Up event at Andi Hakim Nasoetion Auditorium, Dramaga IPB Campus, Bogor, Saturday. “As the only platform for Indonesian entrepreneurs, especially in Bogor, Kadin has the function of providing guidance for entrepreneurs and creating new entrepreneurs in Bogor. Therefore, we will provide support and assistance to students who want to become entrepreneurs, "Erik said. The support and assistance referred by Erik include funding and capital assistance, guidance and promotion assistance in both domestic and international markets. There is also the program of the Kadin foster father who will help new entrepreneurs in running their businesses. "Hopefully in the future we can support each other. Do not hesitate to come to Kadin. We will collaborate to produce new entrepreneurs in Bogor, "Erik concluded.